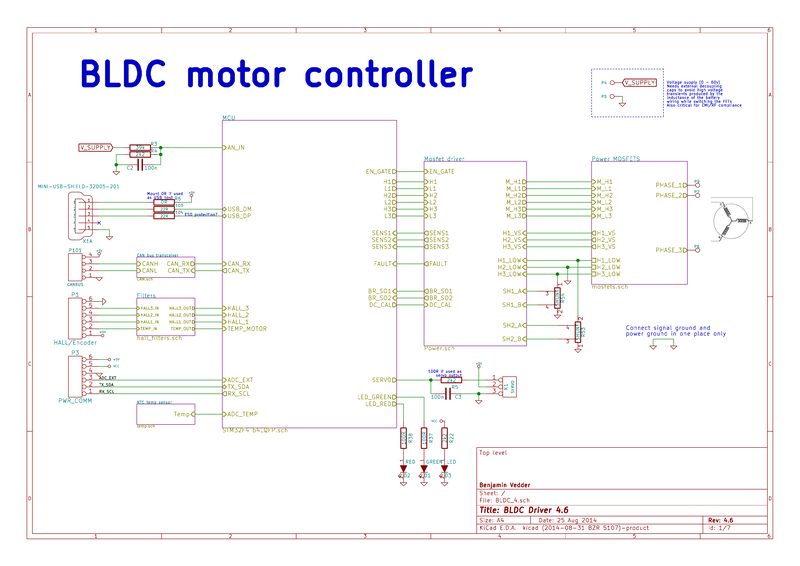 I have made many updates to my custom motor controller recently and the old post is getting confusing with notes and updates, I decided to write a new post about it that hopefully is more clear, more complete and easier to follow. This might sound a bit ambitions, but my goal is to make the best ESC available. I really enjoy sharing knowledge, so I want to keep all the hardware and software open. Because information about the VESC is scattered all over the internet and a lot of information is in email conversations with me, I have created a forum dedicated to the VESC here. The hardware and software is open source. Since there are plenty of CPU-resources left, the customization possibilities are almost endless. DRV8302 MOSFET driver / buck converter / current shunt amplifier. IRFS7530 MOEFETs (other FETs in the same package also fit). 5V 1A output for external electronics from the buck converter integrated on the DRV8302. 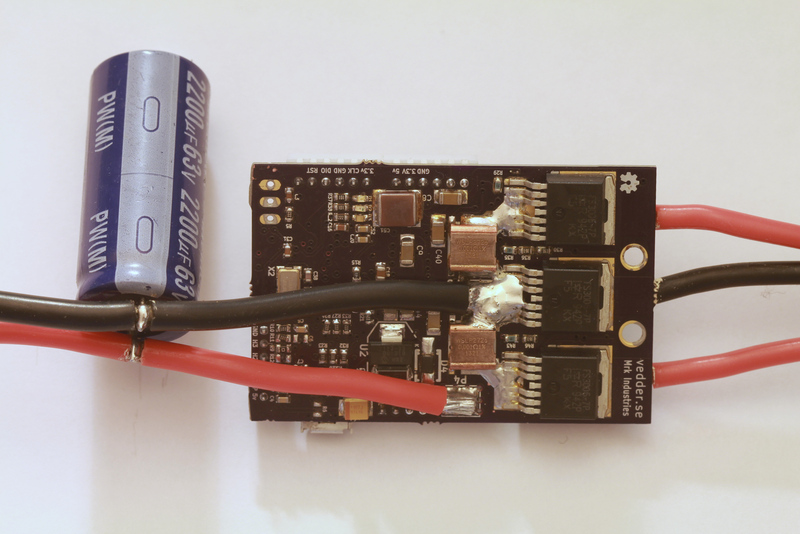 Voltage: 8V – 60V (Safe for 3S to 12S LiPo). Current: Up to 240A for a couple of seconds or about 50A continuous depending on the temperature and air circulation around the PCB. 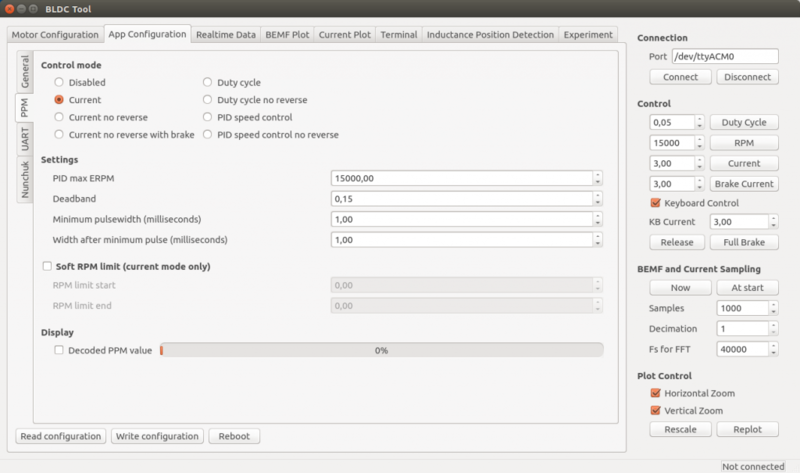 Sensored and sensorless FOC wich auto-detection of all motor parameters is implemented since FW 2.3. PCB size: slightly less than 40mm x 60mm. Current and voltage measurement on all phases. DC motors are also supported. Adaptive PWM frequency to get as good ADC measurements as possible. RPM-based phase advance (or timing/field weakening). 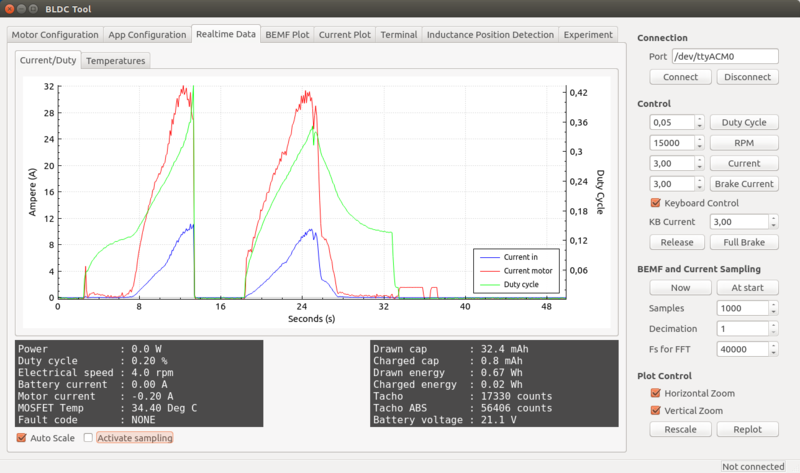 Good start-up torque in the sensorless mode (and obviously in the sensored mode as well). The motor is used as a tachometer, which is good for odometry on modified RC cars. Duty-cycle control, speed control or current control. 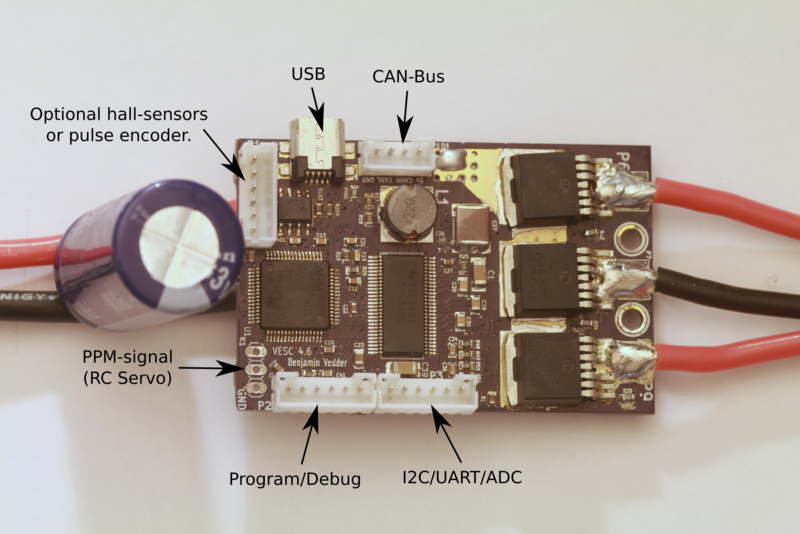 Interface to control the motor: PPM signal (RC servo), analog, UART, I2C, USB or CAN-bus. Wireless wii nunchuk (Nyko Kama) control through the I2C port. This is convenient for electric skateboards. Consumed and regenerated amp-hour and watt-hour counting. Optional PPM signal output. Useful when e.g. controlling an RC car from a raspberry pi or an android device. The USB port uses the modem profile, so an Android device can be connected to the motor controller without rooting. Because of the servo output, the odometry and the extra ADC inputs (that can be used for sensors), this is perfect for modifying an RC car to be controlled from Android (or raspberry pi). When the current limits are hit, a soft back-off strategy is used while the motor keeps running. If the current becomes way too high, the motor is switched off completely. The RPM limit also has a soft back-off strategy. Commutation works perfectly even when the speed of the motor changes rapidly. This is due to the fact that the magnetic flux is integrated after the zero crossing instead of adding a delay based on the previous speed. When the motor is rotating while the controller is off, the commutations and the direction are tracked. The duty-cycle to get the same speed is also calculated. This is to get a smooth start when the motor is already spinning. All of the hardware is ready for sensorless field-oriented control (FOC). Writing the software is the remaining part. However, I’m not sure if FOC will have many benefits for low inductance high-speed motors besides running a bit quieter. 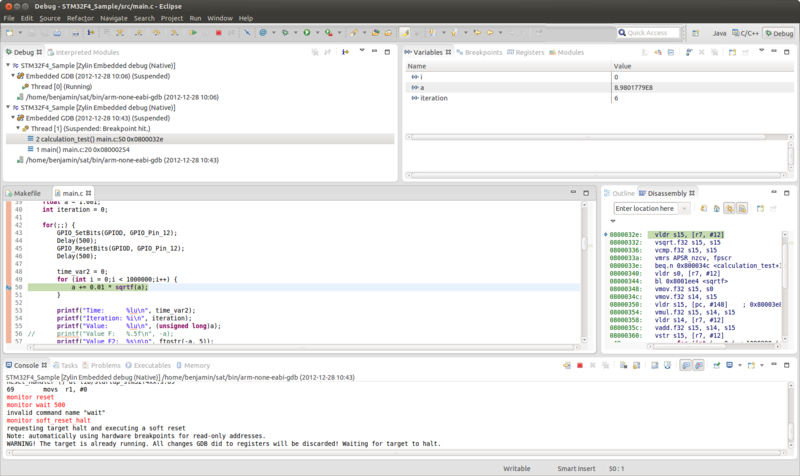 Sensored and sensorless FOC is fully implemented since FW 2.3. There are no hardware low-pass filters that introduce phase delay. Such filters can be avoided because the ADC samples are synchronized to the PWM timer and adjusted dynamically every time the duty cycle or switching frequency is changed. After a zero crossing, the area under the voltage is integrated until a threshold for commutation based on the motor parameters. This integration is robust agaist acceleration and provides good SNR since an integrator is a low-pass filter. There is a parameter that defines the voltage coupling between the windings when measuring the back-emf. This make a huge difference when running at low speeds with low duty cycle. This compensation has a RPM dependence though, which is something I tried to avoid where possible because the RPM estimation has a delay and thus causes problems during acceleration. To get better voltage samples, the switching frequency is adaptive and proportional to the duty cycle. This is because the back-EMF only can be sampled during the ON-time of the PWM cycle and low duty cycles have short ON time. Since the motor is running slowly on low duty cycles, sampling and switching does not have to be as fast to keep up with the motor which makes this less of a problem. Lower switching frequency also decreases switching losses, which is a positive side-effect. When the motor is un-driven, the back-emf on all phases is analysed to track the position, direction and speed of the motor. So when the motor is already spinning, the algorithm will begin in the exact state of the motor (position, duty-cycle, direction). I have also used some hack-ish conditions based on trial and error to improve the startup. Closed loop operation is used from the first commutation, since the measured values are clean enough when using these techniques. Even though the duty cycle is only 5%, the waveform is clean. This is because the switching frequency is low at this speed and the on-time is long enough to get good samples. The first commutation is a bit off at first since the motor is not perfectly aligned, but the second commutation already looks perfect. Update: The ST libraries are no longer required, but you can still use the ChibiOS-version above if you’d like. It should work just as well with the official version. In this example, there are two threads that send and receive RF packets between two RF boards. If this program is uploaded to two RF boards, the red LED on each board should blink because the other board sends packets to switch it on and off and vice versa. The green LED is on as long as the board receives acks from the other board. Auto-ack can also be switched off – then the green LED should be on all the time. This example also emulates an USB modem when the USB cable is plugged in, so you can use you favourite serial terminal to connect to it. The baudrate is ignored and does not matter. On Ubuntu, it will show up as something like /dev/ttyACM0 (or 1 or n) depending on whether you have other USB modems. I have written a new post about my open ESC on this page and also updated the hardware significantly. If you haven’t built it yet and if you are planning to order parts for it, please refer to that page. I will only leave this page for reference in case you have built it before I wrote the new post and updated the hardware. Also, If you have built the ESC before, the tutorial and software on the new page also applies to the old hardware. 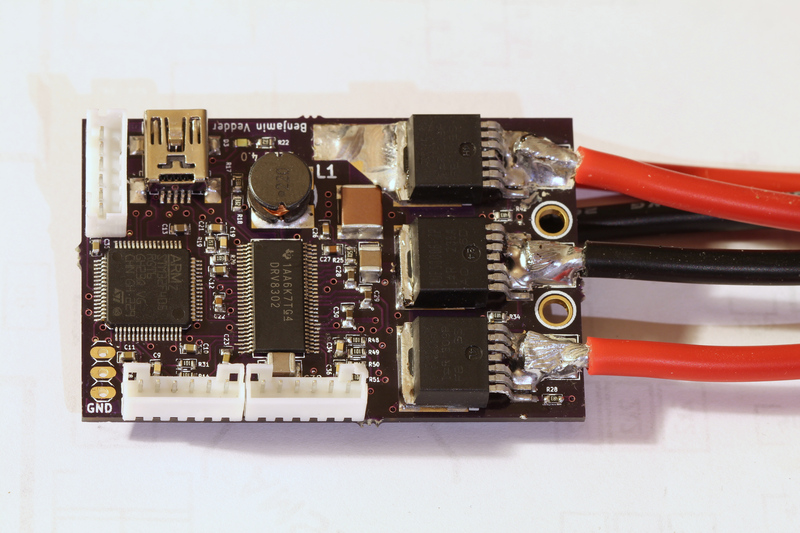 For about three years I have been working on a custom BLDC motor controller (also known as an ESC). I have spent hundreds of hours on writing code and I have made many minor and four major revisions of the printed circuit board (PCB). Now I finally have something that I can publish. The code can still be cleaned up a lot, especially the latest parts that I wrote in a hurry, but I don’t want to delay the release forever. The hardware and software is open source. A DRV8302 MOSFET driver / buck converter / current shunt amplifier. Current: Up to 240A for a couple of seconds or about 50A continuous depending on the cooling. Interface to control the motor: servo signal, analog, UART, I2C, USB or CAN (with a transceiver). Some of these modes need a bit more code to work, but not much. Servo signal output. Good when e.g. controlling an RC car from a raspberry pi or an android device. The USB port uses the modem profile, so an Android device can be connected to the motor controller without rooting. Because of the servo output, the odometry and the extra ADC inputs (that can be used for sensors), this is perfect for modifying a RC car to be controlled from Android (or raspberry pi). When the current limits are hit, a soft back-off strategy is used while the motor keeps running. The commutation works perfectly even when the speed of the motor changes rapidly. This is due to the fact that the magnetic flux is integrated after the zero crossing instead of adding a delay based on the previous speed. 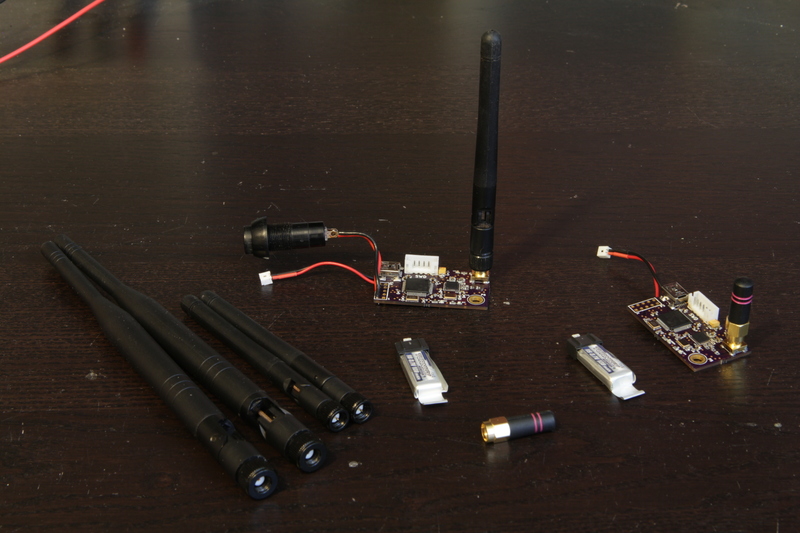 All of the hardware is ready for sensorless field-oriented control (FOC). Writing the software is the remaining part. In this post, I will describe what the essential steps were to port Contiki to this board and how to use my port. I have uploaded the Contiki port together with a few example applications to github. You can download it here. 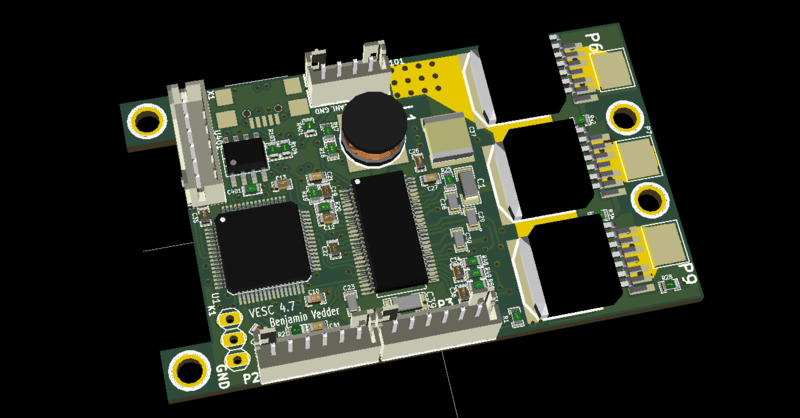 I have made a small PCB with an STM32F4 microcontroller and a TI CC2520 radio transceiver. There are many mote modules available already, but I wanted one optimized for performance as opposed to power consumption. I also wanted to try making a PCB with some RF-parts since I haven’t done that before. Based on one of the examples provided by ST, I have written a program for the STM32F4 Discovery board that plays MP3 files from an USB memory stick. You can download it here. If you use a usb-host cable such as this one you can connect an USB memory stick (with fat32 file system) with mp3-files to the micro-usb port of the stm32f4 discovery. The files should then be played one by one. The user button can be used to skip to the next file. If you follow this tutorial you should be able to build and upload the provided files right away. The main.c-file has many comments, so hopefully you can figure out how it works. Using a USB-memorystick for logging is quite easy with this program as a basis. Only the two usb-pins, 5V and gnd are required to connect it to any stm32 with USB support, so hw-wise it’s even easier than using an SD-card. Based on this, I have written a small program for the STM32F4 Discovery that uses the USB-CDC class to show up as an virtual serial port. I’m using the USB stack provided by ST, however, there is also another project that uses libopencm3 that can be found here. I have routed the write system call to use this port, so the stdio printf function will print directly to this serial port. Download the source code complete with all libraries and makefiles here. Unpack the program and run make from its root directory. The binary file that can be uploaded should appear in the build directory. 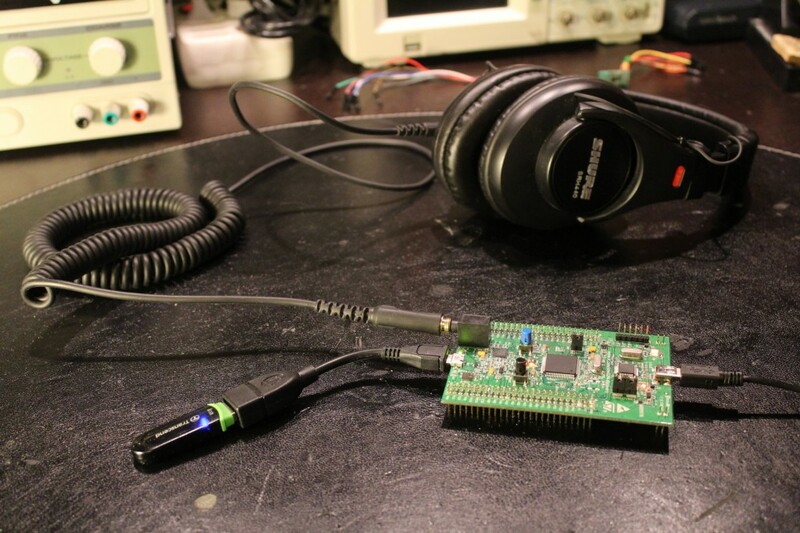 Upload the program to the STM32F4 discovery (again, this post explains how) and plug in a micro-USB cable to the port next to the audio jack. The serial port should show up as /dev/ttyACM0 on most GNU/Linux distributions, such as Ubuntu. Start a serial port terminal, such as gtkterm (sudo apt-get install gtkterm on Debian/Ubuntu), and open ttyACM0. The baudrate does not matter as it currently is ignored by the program (see usbd_cdc_vcp.c). 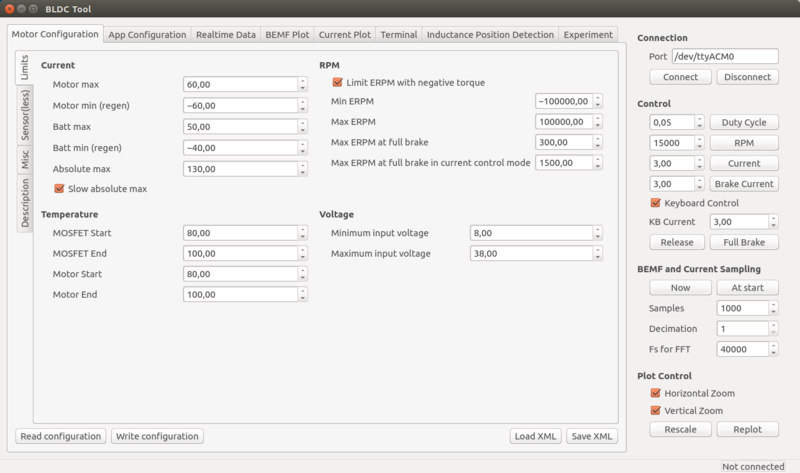 The current program runs some floating point operations and prints the elapsed time on the USB-CDC serial port. The float parameters in the makefile can be changed to see how the FPU affects the speed (and there is a lot of difference). Remember to run clean after changing the float parameters, as the object files are not compatible between hardfloat and softfloat builds.